UN Secretary-General Ban Ki-moon says the Palestinian Authority will join the International Criminal Court on April 1. The Palestinian Authority (PA) will join the International Criminal Court (ICC) on April 1, United Nations (UN) Secretary-General Ban Ki-moon said on Tuesday night, according to The Associated Press. In a statement posted on the UN's treaty website and quoted by the news agency, the secretary-general said "the statute will enter into force for the State of Palestine on April 1, 2015." He said he was acting as the "depositary" for the documents of ratification. The PA formally presented a request to the United Nations on Friday to join the ICC, in a move firmly opposed by both Israel and the United States. The PA has stated intent to file charges of war crimes against Israel in the Hague, but Israel has already filed counter-suits. 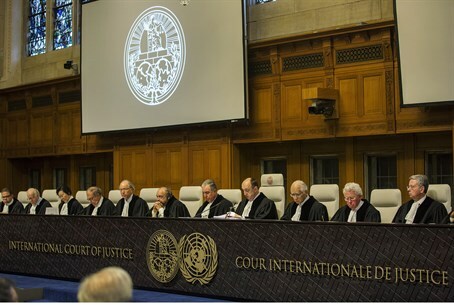 On Monday, legal rights group Shurat Hadin filed three more war crimes charges against the Palestine Liberation Organization (PLO) in the ICC. The PLO already faces criminal charges being levied against it in the US court system for terror attacks it committed during the early 2000s. Even if the PA files charges against Israel, legal rights experts say that having the ICC enter the fray of the Israeli-Arab conflict will ultimately harm the PA, Hamas, and the ICC itself - not Israel.